The party moves south, as the highly anticipated grand finale of the Quest for the Crest Sailfish Series, Final Sail, closes out in Miami Beach this year. A hefty purse in excess of $800,000 is not the only prize teams have their eyes on. The prestigious burgundy jackets are also awarded to the top overall team at this final leg of the series. With an elite fleet of competitors, this world title is as tight as the lines, but the leader will be cut soon and just one team will claim their spot in the competitive sailfishing hall of fame. Major payouts aren’t the only attraction for teams at Final Sail. This grand finale takes place in Miami Beach, with an exciting kick-off party overlooking beautiful Biscayne Bay and a Resorts World Bimini sponsored “Casino Night” where anglers compete on the green felt to help raise money for the tournament charity, Fishing for Muscular Dystrophy. The kick-off party is held Wednesday, April 3rd at the incredibleDoubleTree by Hilton Grand Hotel Biscayne Bay. With a “day of rest” in between, competition starts on Friday, April 5th with lines in at 8 a.m. Following lines out on day one, teams can unwind for happy hour at the famous Monty’s Restaurant in Miami Beach Marina with complimentary drinks and food. Day two of competition is Saturday April 6th and tensions will be high as the final scores determine both the winners of Final Sail and the Quest for the Crest series. Claiming the world champions title and the burgundy jacket requires dominant performances and most importantly – consistency. 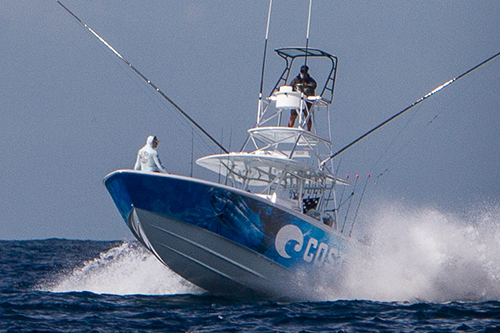 As the final sailfish tournament of the season, teams know what’s at stake in Final Sail. Who will rise to the occasion? The 7th annual Final Sail will be one to remember and the tournament of the season you won’t want to miss. Click here to register now for Final Sail! Registration remains open until the conclusion of the kickoff party on April 3rd. For a complete list of Quest for the Crest standings click here.